Wow, here’s a bottle that has always intrigued me. Just the name alone is strange, CONNELL’S BRAHMINICAL MOONPLANT EAST INDIAN REMEDIES, and a pair of feet with stars surrounding them about takes the cake as far as quirky embossing goes in my book. And how about the lettering font on this bottle. The R in “BRAHMINICAL” is your basic straight leg R, however, the R in “REMEDIES” and “TRADEMARK” are the curved leg R associated with western glass houses. 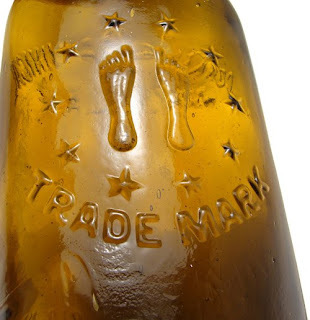 I believe the mold for this bottle was reworked and the “EAST INDIAN REMEDIES” and “TRADEMARK” added at a later date, however, I do not have any concrete proof that this was the case. Was this a bitters, well it certainly was supposed to cure the same ailments as a bitters, I don’t think so but it certainly is an interesting bottle. The definition of BRAHMINICAL is; A member of a cultural and social elite, especially of that formed by descendants of old New England families. Trying to find the definition of MOONPLANT led me to moonflower which is defined as: Any of several unrelated vines which bloom at night. Even the name of this product has me baffled; was it an extract of some sort of climbing vine that was intended to be used by wealthy Boston socialites in the moonlight? I have one of these...it's in decent shape, too!